KoboldCon is the premiere tabletop gaming convention in Colorado Springs, presenting a huge variety of gaming opportunities and geekery right along the Front Range. This will be KoboldCon's THIRD successful year and we could NOT be happier you are considering attending! KoboldCon attendees can also enjoy a number of fun and exciting events throughout the weekend! Virtual Tabletop Gaming Interested in attending KoboldCon, but can't make it here in person? We will also have PLENTY of Virtual Tabletop Games available through our partner applications like Roll20 and Fantasy Grounds! Click here for more info on our Special Guests for 2019!! If you're interested in some AWESOME tournament game play, KoboldCon is the place to be on April 26-28!! With your Gamer Day Pass or Weekend Badge you get ONE FREE Tournament Entry Ticket. This is good for entry in to any of the 10+ tournaments we have going on over the weekend! Game Masters are now able to list games and demos via our event registration system right here on Tabletop.events. Click the "Submit Events" button or click here to register your event. To register your game at KoboldCon, click here! We host a range of gaming-related dealers and exhibitors from across the Front Range and across the country!If there is a game you play, the chances are you will find a dealer with some great deals at the Con! With an awesome "Artist's Alley" and terrific cosplay events, KoboldCon promises to be a tremendous experience for gamers and geek culture fans of all types! Come to the show as a Visitor to just to see the booths, or get a Gaming Badge and hang out with other gamers from around Colorado Springs and across the Front Range for the whole weekend! You'll find both popular and hard-to-find games, rare toys, gaming aids, mint comicbooks, art prints, hand-crafted goods, and gaming-themed clothing and accessories. The spacious and convenient Chapel Hills Event Center is 30k square feet of Gaming Goodness located in the lower level of the Chapel Hills Mall at 1710 Briargate Blvd, Colorado Springs, CO 80920. Look for more information on our Venue page. KoboldCon 2019 is proud to partner with The Academy Hotel for both AMAZING lodging rates over the weekend, as well as serving as our Special Guest hot spot over the weekend! Journey on over for our meet and greet, as well as great drink specials all weekend! Just mention that you are with "KoboldCon" when you call for the group rate! 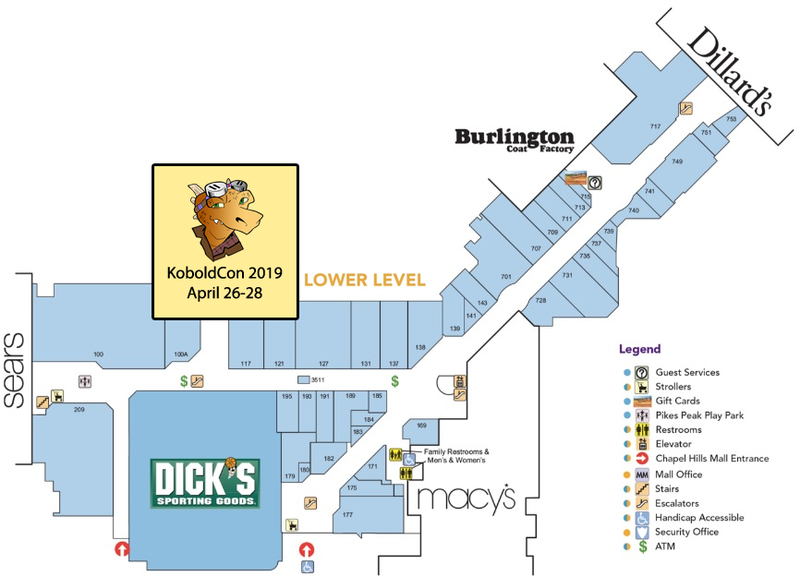 KoboldCon is organized, staffed, and promoted by members of several different local organizations, including: Colorado Springs Tabletop Gaming (link), Colorado Gaming Conventions, Lair of Wonders Productions, and Colorado Toy & Comic Society. The convention is financed by Kobold Company LLC. Sales of tickets and merchandise, vendor fees and sponsorships are also managed by Kobold Company LLC. Kobold Company and Kobold Company LLC are Internet-based, gamers-first organizations dedicated to producing game-related content and organize events.